The Trump administration might think that the United States can’t afford to maintain our pledged contribution to climate aid, but what we really can’t afford is to walk back on that commitment. The real costs of retreating from the Paris climate treaty—the geopolitical, humanitarian, and domestic economic costs—far outweigh the relatively small amount of aid that the U.S. has previously agreed to contribute. To renege on our commitments to climate finance made in support of the Paris Agreement would weaken America’s ability to muster enthusiastic support on important international policies we might care about. Flash forward a year, when the U.S. administration is attempting to lead on a policy it cares about, and requires some willing allies for a coalition to put boots on the ground, or wants votes in the United Nations General Assembly and Security Council. Which countries will be there when we need them? If we stop or sharply reduce our funding to the world’s most vulnerable and poor nations as they struggle to cope with rising intensity of heat waves, sea level rise, strengthened hurricanes, and crop-withering droughts, we will be party to a preventable humanitarian crisis. The poorest nations were scarcely responsible for creating the problem of climate change, and they are ill prepared to handle the consequences. To be isolationist and shortsighted on the question of climate change will bring blowback beyond what we can afford. Adhering to the Paris Agreement and meeting our climate finance pledges will in the end be far cheaper. Many governments are watching closely to see if the new administration in Washington will choose to remain a party to the 2015 Paris Agreement. Already, some foreign negotiators have said that, if President Donald Trump refuses to play fair on climate change, they similarly won’t cooperate on other global issues, like trade and security. The deal struck in Paris was a delicate one, but in the end nearly every nation on Earth agreed that it was in their interest to be part of a collective effort to avoid the most dangerous impacts of heating the planet with unrestrained fossil fuel consumption. The innovation of Paris was that the whole agreement is built on voluntary national pledges, called “nationally-determined contributions.” The only binding part of the entire package is that actions toward meeting those pledges must be reported transparently back to the U.N. agency that coordinates the process, the U.N. Framework Convention on Climate Change (UNFCCC). The Paris Agreement also calls for five-year reviews of progress toward its ultimate goal of keeping average global warming below 3.6 degrees F (2 degrees C). Early in the Paris text, there is some language that “[s]upport shall be provided to developing country Parties” by developed countries to help reduce their emissions and cope with the impacts of climate change with finance that is adequate to those needs. The agreement reaffirms an earlier collective pledge from the developed nations to jointly provide $100 billion a year in grants, loans, and investments in developing countries, from public and private sources. The Obama administration significantly increased America’s pledges of finance to cope with climate change and avoid emissions in developing countries, describing in its 2016 report to the UNFCCC how “climate change [is] disrupting people’s lives and damaging our economy … [and] delaying our response will only make the situation worse for people around the world.” With the world’s poorest nations extremely vulnerable to a rising set of issues, relatively small amounts of aid can help them prepare for, cope with, and recover from climate disasters. For the past few years, the Obama administration has been delivering about $2.7 billion per year in climate finance to help developing nations avoid the worst effects and cut back on their emissions of greenhouse gases, which in the context of overall global needs is tiny. Thus far, the money has flowed through very different channels, and varies in nature and purpose. Large amounts of the funding come as loans, some of which are below market interest rates, but are repaid. Over time, then, the cost of those loans for America can be near zero or even negative. Other funding is provided in the form of insurance for American companies doing renewable energy or adaptation technology business in developing countries. This approach to aid benefits American firms first and creates American jobs, while also reducing emissions globally. Some funding flows “bilaterally” through agencies like U.S. Agency for International Development and the Department of Energy, while other chunks are provided to the World Bank or specialized U.N. funds and facilities. Some support is for adaptation ($207 million per year), but most goes toward clean energy ($608 million per year) and “sustainable landscapes” ($208 million per year). Most of that last category goes for protecting rainforests (and thus biodiversity) in the tropics. 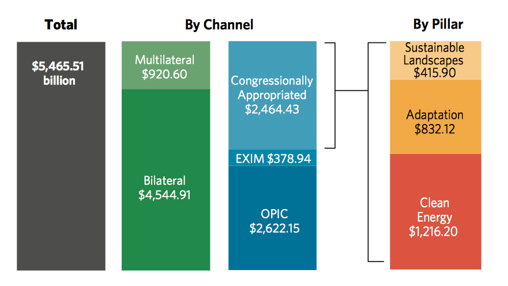 Note: EXIM = Export-Import Bank of the United States; OPIC = Overseas Private Investment Corporation. Source: Second Biennial Report of the USA under the UNFCCC. 2016, page 43. In terms of returns on investment, climate finance is ridiculously cheap for what America gets for it: goodwill and cooperation, less warming, clean and resilient growth, and, importantly, fewer refugees. For a contribution of just $53 million to the Least Developed Countries Fund in 2015, the U.S. gained significant goodwill from the 48 poorest nations on earth, and from the broader network of 134 developing countries. With our contributions to the World Bank and other regional banks, the U.S. helps decide where many times that amount is spent. U.N. fund contributions can create many American jobs. Four-fifths of American contributions are made through our own agencies like USAID and the Export-Import Bank. With energy use soaring over the past decade in Asia, it is clear that helping emerging economies avoid tapping their coal reserves in favor of installing renewable sources in solar, wind, tidal, wave, and geothermal energy will be essential in mitigating their carbon emissions without unfairly stifling their economic development. What’s more, these renewable energy sectors hold vast business potential for American companies wanting to supply technical expertise and equipment. Establishing the U.S. as a leader in green energy is directly in the Trump administration’s interest as it aspires to slow, or at least balance, China’s expanding global clout. Export support agencies can make a huge difference in the success of our firms: missing out on the Asian market assures that the likes of China and India will outcompete America. The U.S. is far from invincible on the international stage, and it will only become more vulnerable to geopolitical instability if we proceed to alienate the rest of the world by refusing to follow through on our commitments in Paris. Asia’s fate will have planetary consequences as well. Future sea level rise and summer heat waves will be driven largely by what happens in Asia’s booming economies, so helping those countries lower emissions is in everyone’s interest. If we can mitigate these emissions now, we can avoid the exorbitant costs of moving homes and evacuating coastal areas due to rising seas later. Some estimates of the costs of coastal erosion are astronomical, which bolsters the case for immediate action to reduce emissions globally as simply a sensible precaution. Aid to help poor rural farmers on marginal lands adapt and thrive can be the key to avoiding a surge of climate refugees flowing either into already crowded urban centers in the developing world or, worse yet, forcing people to set out on dangerous voyages over land or water in search of a livable future. In security terms, the U.S. military and relief agencies alike understand that an ounce of this kind of prevention is worth a pound of cure. Far from invincible, the U.S. will only become more vulnerable to geopolitical instability if we alienate the rest of the world by reneging on the commitments embodied in the Paris Agreement. Climate aid, loans, and investments are smart business investments that we’d be foolish to miss.